Join the discussion on our forums! Come discuss Ebon Dragonsmith over in our dedicated Ebon Dragonsmith discussion topic. with Warrior getting Dragon synergy cards and Paladin having a lot of powerful but expansive weapons. Not in Standard at least, but with access to Blackrock cards in wild, Dragon Paly could do great with this card. A great card for dragon warrior. This is a pretty good card. Probably a one of in decks that try to cheat out the Legendary weapon early with some dragon synergy. Realistically it will be probably best utilized in Priest dragon decks. and even cheaper BUY IT NOW! Maybe Dragon Mage is a thing. Especially since it would be stronger against Priest. 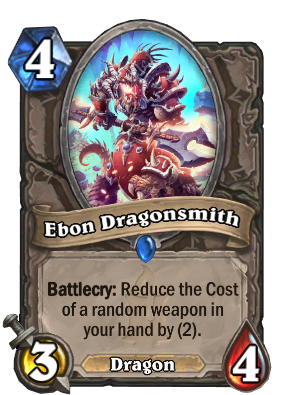 The Dragons and Catacombs, have another dragon and all heroes have a weapon, this means that this card is good. Wild Dragon Warrior card. Can't seeing it used for much else. Most classes don't need their legendary weapon cheaper that desperately. Question is: Would the discount on Kingsbane keep when it goes into the deck again? I would think so, since other minion provided weapons buffs work. However, would you really want an understated minion just to make your 1-cost weapon cost 0?